Trade deficit and illegal immigration are down; real weekly earnings and federal debt are up. Our quarterly update of Obama's scorecard. Those are just some of the findings in our latest installment of Obama’s Numbers. 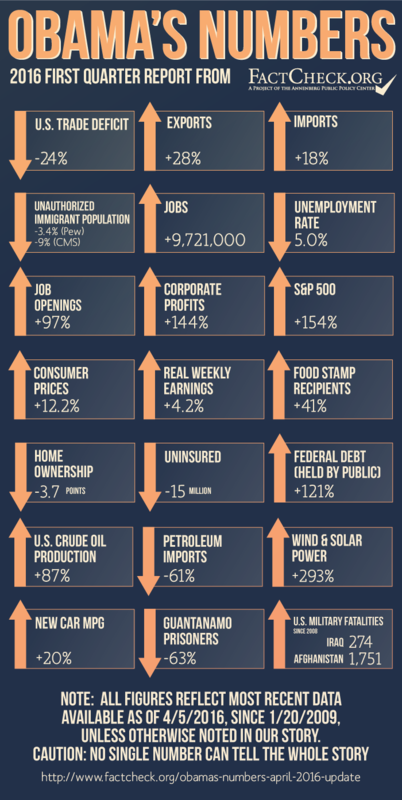 As we do every three months, we offer here a fresh update of selected statistical indicators of what has happened since Barack Obama first took the oath of office in January 2009. We leave it to our readers to judge how much credit or blame the president deserves for what has happened on his watch, and we caution that no single number or collection of numbers can tell the entire story. What we offer here are some key yardsticks from sources we consider solid and reliable. We start with a subject that has been much criticized by some leading candidates seeking to succeed President Obama in the White House: the U.S. record on trade. 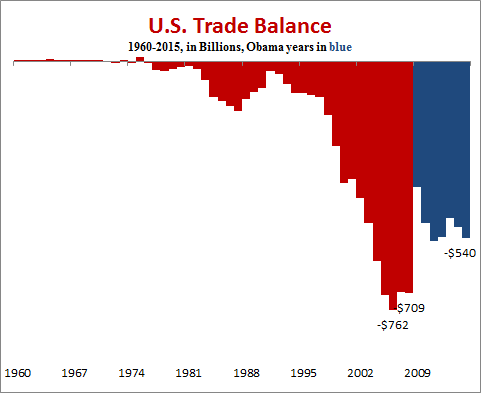 Trade Balance – The U.S. trade deficit, which had grown relentlessly since the 1970s, has shrunk 24 percent during Obama’s time in office. In 2015, the U.S. imported $540 billion more in goods and services than it exported, compared with a deficit of $709 billion in 2008, and with the record deficit of $762 billion of 2006. The trade deficit shrank even more dramatically in Obama’s first year, to $384 billion. That was a result of a worldwide recession that dampened consumer spending and drove down the price of crude oil, a major component of U.S. imports. Since then the trade gap fluctuated between $549 billion (in 2011) and $478 billion (in 2013). Exports – To be sure, Obama had promised to narrow the gap even more, vowing in his 2010 State of the Union address to “double our exports over the next five years.” The president fell far short of that goal, however. As of the final quarter of 2015, according to the most recent quarterly report of the Commerce Department’s Bureau of Economic Analysis, U.S. exports of goods and services have gone up by only 27.8 percent since the quarter before Obama took office. Lately, exports actually have been shrinking as the economies of China and other U.S. trading partners struggle. Fourth-quarter exports were down 2 percent from the previous quarter, and were 7.6 percent below the final quarter of 2014. That leaves Obama’s promise to double exports even further out of reach. Imports – Even so, exports have grown faster than imports, which are up only 18.2 percent under Obama, compared with the 27.8 percent rise in exports. In the last quarter of 2015, imports were down 2.3 percent from the previous quarter, and 5.5 percent from the last quarter of 2014. A big factor moderating the value of imports during Obama’s tenure is that the U.S. is buying much less foreign oil, at much lower prices, a subject we address later in this article. Another hot issue in the 2016 race for the White House is illegal immigration. But during Obama’s time in office, the number of people living in the U.S. illegally has actually declined, according to independent estimates by demographers. The Pew Research Center estimated the number at 11.7 million in 2008, and most recently at 11.3 million in 2014, a decline of roughly 400,000, or 3.4 percent. The Department of Homeland Security hasn’t published an estimate since 2013, but said then that the population “likely peaked around 2007” at 11.8 million or 12 million. DHS estimated the number at 11.4 million as of 2012. Two factors are often cited for the decrease. First, the recession that started in December 2007 made jobs scarce, cutting the incentive for foreigners to sneak across the border to find a job, or to stay on illegally after their visas expired. Another reason is tougher enforcement at the borders. Obama inherited a vastly increased number of border patrol agents, which hit 20,119 in the fiscal year that began Oct. 1, 2008, up 63 percent from three years earlier. Under Obama, the number of agents increased even more, and it has remained above that level despite recent spending cuts. The number of agents was 20,273 in fiscal year 2015. Number of Jobs — The economy has added 456,000 jobs since we published our last report. As of March, total nonfarm employment stood 9,721,000 higher than when Obama first took office. That 9.7 million gain is less than the nearly 23 million jobs gained during the booming years of Bill Clinton’s presidency, but seven times greater than the 1.3 million added during President George W. Bush’s eight years, which were plagued by two recessions. Unemployment Rate — Meanwhile the unemployment rate remained at 5 percent, where it had been as of our last update. The rate fell to 4.9 percent in January and February but ticked back up in March. It’s now 2.8 percentage points lower than it was in January 2009, when the president first took office in the midst of the worst economic downturn since the Great Depression. Furthermore, the jobless rate is now significantly lower than the historical norm. In all the months between 1948 and the time Obama took office, the median jobless rate was 5.5 percent. Job Openings — The number of job openings has nearly doubled under Obama. In July of last year, the number of job openings reached nearly 5.8 million — the highest level in the 15 years that the Bureau of Labor Statistics has been tracking it. And as of the end of February, the most recent month on record, the BLS said there were 5,445,000 job openings. That’s 97 percent more than in January 2009, and only 6 percent below the record July level. The number of job openings now has exceeded 5 million for 13 consecutive months. Labor Participation Rate —With jobs plentiful, many who hadn’t been looking for work are starting to do so. The labor force participation rate rose again in March to 63 percent, the highest point in two years. But the participation rate (the portion of the entire civilian population age 16 and over that is either employed or currently looking for work) is still 2.7 percentage points lower than when Obama took office. That decline is due mostly to factors outside the control of any president — factors such as the post-World War II baby boomers reaching retirement age. The rate peaked and started a long-predicted decline in 2000, the year that people born in 1945 turned 55 and became eligible for early retirement benefits under Social Security. Survey data published by the Bureau of Labor Statistics in December show that those outside the labor force in 2014 said their reasons for not working were retirement (44 percent), illness or disability (19 percent), school attendance (18 percent) or home responsibilities (15 percent). Only 3 percent said they couldn’t find a job, or gave some other reason. Long-term Unemployment — One lingering effect of the 2007-2009 recession is the number of long-term unemployed — those who have been looking for work for 27 weeks or longer. While the number of long-term jobless is 486,000 fewer than when the president first took office, it has gone up 128,000 since our last report, to stand at just over 2.2 million. That’s 889,000 higher than in December 2007, at the start of the Great Recession. The average length of unemployment also remains far above pre-recession levels. On average, those who were unemployed in March had been without work for 28.4 weeks. That’s 11.8 weeks longer than at the start of the recession, and 8.6 weeks longer than the month Obama first took office. Corporate Profits — Corporate profits have soared under Obama. After-tax profits were running at an annual rate of well over $1.6 trillion in the October-December quarter of 2015, the most recent figures available. That’s down somewhat from the previous two quarters. But it is still 144 percent higher than in the quarter just before Obama entered office. That quarter’s profits were unusually low, ravaged by the recession. But after-tax profits in the most recent quarter are still running much higher than at any time before Obama took office — 16 percent higher than in their best quarter prior to 2009, which was the third quarter of 2006. Stock Markets – Stock prices have rallied strongly since our last report, which came just after the worst stock market opening to a new year on record. In February stocks rebounded, with the Dow Jones Industrial Average posting its biggest quarterly comeback since 1933. And after that epic collapse and recovery, stockholders were still doing quite well under Obama. The Standard & Poor’s 500-stock index was 154 percent higher at the close on April 5 than it was the day Obama took office. Other stock indexes show similarly robust gains. The Dow Jones Industrial Average also has more than doubled, rising 121 percent during Obama’s tenure, and the NASDAQ Composite index has more than tripled, rising 236 percent. Consumer Prices – Overall inflation during Obama’s first seven years in office has been half the historical average, and has actually turned negative since our last report. The average yearly rise in the Consumer Price Index under Obama has been just 1.7 percent, measured from December to December. That’s well under half the post-World War II average, according to BLS figures. From 1946 to 2008, the average December-to-December rise in the CPI was a bit more than 4 percent. In the entire history of the CPI, which began in 1913, the average December-to-December increase was just under 3.4 percent up until the time Obama took office — and double the average rate since then. Furthermore, inflation has slowed as the economy has warmed up. During the 12 months ending in December 2015, the rise was 0.7 percent. And during the 12 months ending in February (the most recent figures yet released), the rise was below 1 percent. The CPI has actually declined one-quarter of 1 percent since our last report three months ago. For all of Obama’s time in office, the CPI has gone up by only 12.2 percent. In the eight years of the Bush administration, the CPI went up 20.7 percent. Gasoline – The national average price of regular gasoline bounced up to $2.08 in the week ending April 4, according to the U.S. Energy Information Administration. That’s up by less than a dime since our last report, but still only 13 percent above the abnormally low point at which it stood on Inauguration Day 2009, when demand was suppressed by a worldwide recession. And it’s barely half the record price of more than $4.11 per gallon reached in July 2008, when George W. Bush was in the White House. Real Weekly Earnings – The recovering economy, coupled with continuing low inflation, has boosted the buying power of weekly paychecks significantly since Obama took office, and especially in the last two years. The BLS measure of average weekly earnings for all workers, adjusted for inflation and seasonal factors, was 4.2 percent higher in February than it was when Obama first took office. That gain is even more impressive considering that real weekly earnings sank 1.4 percent during Obama’s first five months in office, as the Great Recession of 2007-2009 was raging. Since the low point reached in June 2009, real weekly earnings have gone up 5.7 percent. Most of the gain is recent — real wages are up 3.6 percent in the last 24 months alone. With more people working and real wages rising, the number of people receiving food stamps edged down again since our last report, by nearly 180,000. But as of December 2015, the most recent month on record, nearly 45.2 million Americans were still receiving the food aid, now known as the Supplemental Nutrition Assistance Program. That’s 5.5 percent lower than the record level set in December 2012, but still 41 percent higher than it was when Obama took office in 2009. As we noted when Republicans called Obama the “Food Stamp President,” 14.7 million people were added to the food-stamp rolls during George W. Bush’s time in office. By comparison, the net gain under Obama now stands at 13.2 million — and it’s slowly declining as the economy improves. The home ownership rate ticked upward again since our last report, after reaching the lowest point in nearly half a century. In the fourth quarter of 2015, 63.8 percent of households owned their own home, according to the latest Census Bureau figures. The home ownership rate began to slide before Obama took office. It peaked at 69.2 percent in the second quarter of 2004. But most of the decline since then has occurred under Obama. The rate reached 63.4 percent in the second quarter of 2015, which was the lowest since 1967. It has now rebounded by 0.4 percentage points since that low, but is still 3.7 percentage points lower than in the quarter just before Obama first entered the White House. The number of people lacking health insurance is little changed from our last report, according to the most recent data from the National Health Interview Survey conducted by the Centers for Disease Control and Prevention. During the first nine months of 2015, about 28.8 million people of all ages reported being without coverage at the time they were interviewed, the CDC reported in its most recent quarterly report. That’s down from 43.8 million during all of 2008 (see Table 1.1a), a drop of nearly 15 million people since Obama first took office. As a percentage of all U.S. residents, the uninsured have dropped to 9.1 percent of the population in the first half of last year, from 14.9 percent in 2008. Debt – The U.S. government’s debt owed to the public has more than doubled. As of April 1, it was just shy of $14 trillion, an increase of 121 percent since Obama first took office. And the debt also has grown dramatically even when measured as a percentage of the growing economy, from 52 percent of gross domestic product at the end of fiscal year 2009 to a projected 75.4 percent by the end of the current fiscal year, according to the most recent estimate by the nonpartisan Congressional Budget Office, published March 24. Deficits – Annual federal deficits hit $1.4 trillion in fiscal year 2009. As we’ve documented elsewhere, Obama inherited most of that deficit and signed spending measures that contributed, at most, $203 billion to FY 2009’s red ink. Since then, the yearly deficits have declined markedly. In fiscal year 2015, which ended last Sept. 30, the deficit was $438 billion, a drop of 69 percent from FY 2009. But without further cuts in spending or increases in revenue, Obama will leave his successor with debt and deficits rising as far as the eye can see. CBO projects that under current law, annual deficits will rise to $534 billion in the current fiscal year, and will again top $1 trillion in 2022 and beyond. As things stand, federal debt owed to the public will reach nearly 80 percent of GDP in 2022, and nearly 86 percent in 2026, CBO projects. U.S. Crude Oil Production – The total cost of all U.S. imports has been held down in part by a remarkable boom in U.S. crude oil production, which has nearly doubled during Obama’s tenure. In the fourth quarter of last year, the U.S. produced 87 percent more crude oil than it did in the three months before Obama began his presidency. To be sure, the boom has peaked and production has declined somewhat in recent months. But that’s because the price of crude oil has plunged from more than $100 a barrel in 2014 to below $38 last week. That in turn has led to less drilling and a decline in U.S. production. Oil Imports & Dependency — Even so, U.S. reliance on imported oil has been cut by more than half. Under Obama, as of the fourth quarter of 2015, net imports were down 61 percent. And in 2015, the U.S. imported only 24 percent of the petroleum and refined products that it consumed. That’s the lowest annual level of dependency on imports since 1970. The U.S. oil boom is due mainly to advances in drilling technology rather than to any change in government policy. The decline in dependency on imports actually began in 2006, after peaking at 60.3 percent the year before. The trend continued under Obama. Wind & Solar – Wind and solar power has nearly quadrupled under Obama. Electricity generated by large-scale wind and solar power in the most recent 12 months on record (ending in January) was 293 percent higher than the total for 2008. The increase in solar power in particular has been spectacular. The U.S. generated 31 times more electricity from solar power in the most recent 12 months than it did in the year before Obama took office. However, wind and solar still accounted for only 5.4 percent of total large-scale generation in the most recent 12 months, up from 1.4 percent in 2008. These figures are for “utility scale” electric generation. In 2014, EIA also began tracking small-scale (under 1 megawatt) “distributed” solar voltaic generation, such as the power produced by rooftop systems installed by homeowners. In the most recent 12 months, wind and solar accounted for 5.7 percent of the combined total of utility-scale power and “distributed” solar power. Car Mileage — The fuel efficiency of new vehicles has improved a bit since our last report. The average EPA city/highway sticker mileage of light duty vehicles sold in March was 25.3 miles per gallon, according to the Transportation Research Institute of the University of Michigan. That’s 0.3 above the December figure. However, the latest figure still leaves the president far short of his goal. He boasted in 2013 that “we have doubled the distance our cars will go on a gallon of gas.” What he meant was that the administration was putting in place government requirements that cars and light trucks average 54.5 mpg by model year 2025. Progress toward that goal has been slowed by low gasoline prices, which have prompted consumers to buy more pickup trucks and big sport-utility vehicles and not so many smaller, thrifty cars. As a result, new-vehicle mileage has actually declined 1.9 percent since peaking in August 2014. It is now 20 percent higher than when Obama took office. Since our last report, more than a dozen prisoners have been released from the military detention camp for suspected terrorists in Guantanamo Bay, Cuba. They include 10 Yemeni prisoners sent to Oman as a group in January, and two Libyan prisoners sent to Senegal on April 3. But as of April 5, 89 still remained at the facility that Obama ordered to be closed within a year of his first taking office. In the seven years since then, the population has been reduced by 63 percent. More are expected to be released soon. The president said in a Dec. 18, 2015, news conference that “we will continue to steadily chip away at the numbers in Guantanamo.” The New York Times reported April 4 that nine more prisoners were expected to be transferred out within the following two weeks. Since our last report, three more have died supporting continuing U.S. military operations in the Middle East. A Marine sergeant died March 19 in northern Iraq from wounds inflicted when his unit came under attack from rocket fire while he was serving in support of operations against Islamic State fighters. Two others died of non-combat related causes, an Air Force major at a U.S. base in Qatar, and a Navy civilian who died in Bahrain. According to iCasualties.org, those deaths brought total military fatalities since Obama took office to 1,751 in the Afghan war and 274 in the Iraq conflict. U.S. Census Bureau. “U.S. Trade in Goods and Services – Balance of Payments (BOP) Basis.” 4 Mar 2016. U.S. Department of Commerce, Bureau of Economic Affairs. “Table 1. U.S. International Transactions: Exports of Goods and Services.” 17 Mar 2016. U.S. Department of Commerce, Bureau of Economic Affairs. “Table 1. U.S. International Transactions: Imports of Goods and Services.” 17 Mar 2016. Passel, Jeffrey and D’Vera Cohn. “Unauthorized immigrant population stable for half a decade.” Pew Research Center. 22 Jul 2015. Warren, Robert. “US Undocumented Population Drops Below 11 Million in 2014, with Continued Declines in the Mexican Undocumented Population.” Journal on Migration and Human Security. Center for Migration Studies. 20 Jan 2016. Baker, Bryan and Nancy Rytina. “Estimates of the Unauthorized Immigrant Population Residing in the United States: January 2012.” Office of Immigration Statistics; U.S. Department of Homeland Security. Jan 2012. U.S. Border Patrol. “Border Patrol Agent Staffing by Fiscal Year.” 19 Sep 2015. Bureau of Labor Statistics. “Employment, Hours, and Earnings from the Current Employment Statistics survey (National); Total Nonfarm Employment, Seasonally Adjusted.” Data extracted 5 Apr 2016. Bureau of Labor Statistics. “Labor Force Statistics from the Current Population Survey; Unemployment Rate, Seasonally Adjusted.” Data extracted 5 Apr 2016. Bureau of Labor Statistics. “Job Openings and Labor Turnover Survey: Job Openings, Seasonally Adjusted.” Data extracted 5 Apr 2016. Bureau of Labor Statistics. “Labor Force Statistics from the Current Population Survey; Labor Force Participation Rate.” Data extracted 5 Apr 2016. Bureau of Labor Statistics. “Labor Force Statistics from the Current Population Survey; Number Unemployed for 27 Weeks & Over, Seasonally Adjusted.” Data extracted 5 Apr 2016. Bureau of Labor Statistics. “Labor Force Statistics from the Current Population Survey; Average Weeks Unemployed, Seasonally Adjusted.” Data extracted 5 Apr 2016. Federal Reserve Bank of St Louis. “Corporate Profits After Tax (without IVA and CCAdj) (CP).” Data extracted 12 Jan 2016. Shell, Adam. “Stocks close out week with worst start to year ever.” USA Today. 9 Jan 2016. Wang, Christine and Jacob Pramuk. “Dow posts biggest quarterly comeback since 1933.” CNBC.com. 31 Mar 2016. Google Finance. “S&P 500.” Historical prices. Data extracted 5 Apr 2016. Google Finance. “Dow Jones Industrial Average.” Historical prices. Data extracted 5 Apr 2016. Google Finance. “NASDAQ Composite.” Historical prices. Data extracted 5 Apr 2016. Bureau of Labor Statistics. “Consumer Price Index – All Urban Consumers.” Data extracted 5 Apr 2016. U.S. Energy Information Administration. “Weekly U.S. Regular All Formulations Retail Gasoline Prices (Dollars per Gallon).” Data extracted 5 Apr 2016. Bureau of Labor Statistics. “Employment, Hours, and Earnings from the Current Employment Statistics survey (National); Average Weekly Earnings of All Employees, 1982-1984 Dollars.” Data extracted 5 Apr 2016. Bureau of Labor Statistics. “Employment, Hours, and Earnings from the Current Employment Statistics survey (National); Average Weekly Earnings of Production and Non-supervisory Employees, 1982-1984 Dollars.” Data extracted 5 Apr 2016. U.S. Department of Agriculture, Food and Nutrition Service. “Supplemental Nutrition Assistance Program (Data as of March 4 2016).” Data extracted 5 Apr 2016. U.S. Census Bureau. “Time Series: Not Seasonally Adjusted Home Ownership Rate.” Data extracted 5 Apr 2016. Centers for Disease Control and Prevention; National Health Interview Survey. “Health Insurance Coverage: Early Release of Estimates From the National Health Interview Survey, January–September 2015.” Feb 2016. U.S. Treasury. “The Debt to the Penny and Who Holds It.” 1 Apr 2016. Data extracted 5 Apr 2016. U.S. Treasury. “Final Monthly Treasury Statement of Receipts and Outlays of the United States Government for Fiscal Year 2015.” Oct 2015. Office of Management and Budget. “Table 1.1—Summary of Receipts, Outlays, and Surpluses or Deficits (-): 1789–2020.” Mar 2015. Congressional Budget Office. “CBO’s March 2016 Report: Updated Budget Projections: 2016 to 2026.” 24 Mar 2016. Office of Management and Budget. “Table 1.1—Summary of Receipts, Outlays, and Surpluses or Deficits (-): 1789–2021.” Mar 2016. U.S. Energy Information Administration. “U.S. Crude Oil Production.” Short Term Energy Outlook. 8 Mar 2016. Data extracted 5 Apr 2016. U.S. Energy Information Administration. “Table 3.3a. Monthly Energy Review.” 29 Mar 2016. U.S. Energy Information Administration. Electric Power Monthly, “Table 1.1.A. Net Generation from Renewable Sources: Total (All Sectors), 2006-January 2016.” 25 Mar 2016. Sivak, Michael and Brandon Schoettle. “Average sales-weighted fuel-economy rating (window sticker) of purchased new vehicles for October 2007 through March 2016.” University of Michigan Transportation Research Institute. 4 Apr 2016. Ackerman, Spencer. “Ten Yemeni Guantá​namo detainees arrive in Oman after transfers.” The Guardian. 14 Jan 2016. Savage, Charlie. “2 Libyan Guantánamo Inmates Are Transferred to Senegal.” The New York Times. 4 Apr 2016. New York Times. The Guantanamo Docket. “A History of the Detainee Population.” 4 Apr 2016.
iCasualties.org. “Operation Enduring Freedom/Afghanistan; Afghanistan Coalition Military Fatalities by Year.” Data extracted 5 Apr 2016.
iCasualties.org. “Operation Iraqi Freedom; Iraq Coalition Military Fatalities by Year.” Data extracted 5 Apr 2016.